Paige kitty loves school. This Fall she is starting kindergarten and she is over the moon excited about it. So excited in fact, she’s had no time for Summer activities. It’s been pencils and books, letters and numbers all Summer long. When the rest of the kids are at the swimming pool Paige is playing teacher. Paige is very pleased it is finally August because that means the first day of school is right around the corner. It also means back-to-school shopping. Paige picked out a new plaid dress, a new backpack and a new pair of shoes. She had some trouble deciding between the orange loafers and the brown t-straps but in the end the mary janes won out. Finally it was time to head to the store for supplies and then home to pack up her backpack. Now that she’s all set, shoes are polished, backpack is packed, ribbon tie is tied the only thing left to do is practice waiting for the bus. so adorable! I love the orange loafers, even though the maryjanes do look splendid with the plaid dress. I am so curious– how do you get your dolls to stand up and pose so well? if the loafers don’t fit katie can i have them? hey Hilary maybe you should go into the shoe designing trade, i think you’ve got the knack for it! I love the stories you write for your dolls! You should write a series of children’s books, using these wonderful photographs as illustrations! So so darling! I love her, and I love the story that goes with her. Amazing! I know it was not your intent, but this totally made me cry. I just picked up Mia’s kindergarten supply list this morning. Conflicting emotions. Looking at a pink eraser breaks my heart. My favorite part has to be the backpack with the numbered ribbon straps. I want one! 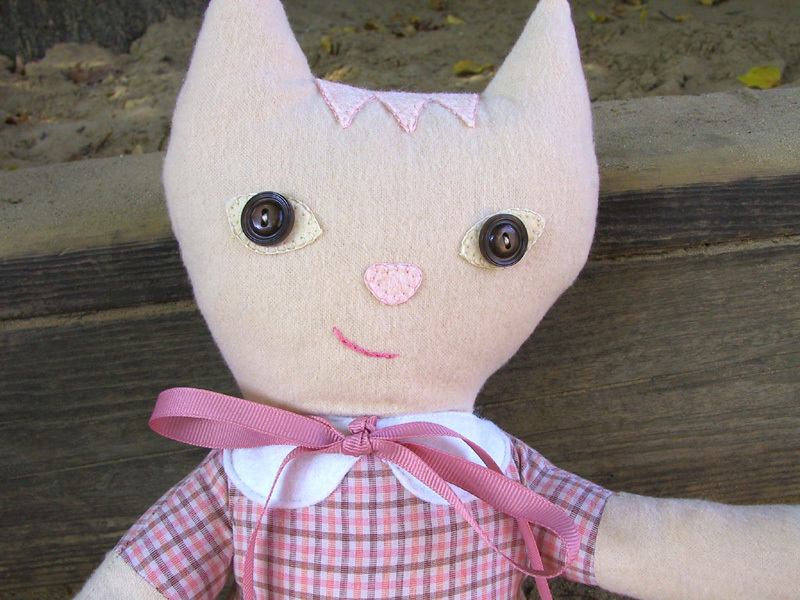 You really make some of the sweetest dolls! Each one of them has such a definite personality, and your talent for that is really remarkable. I really admire the work that you do. 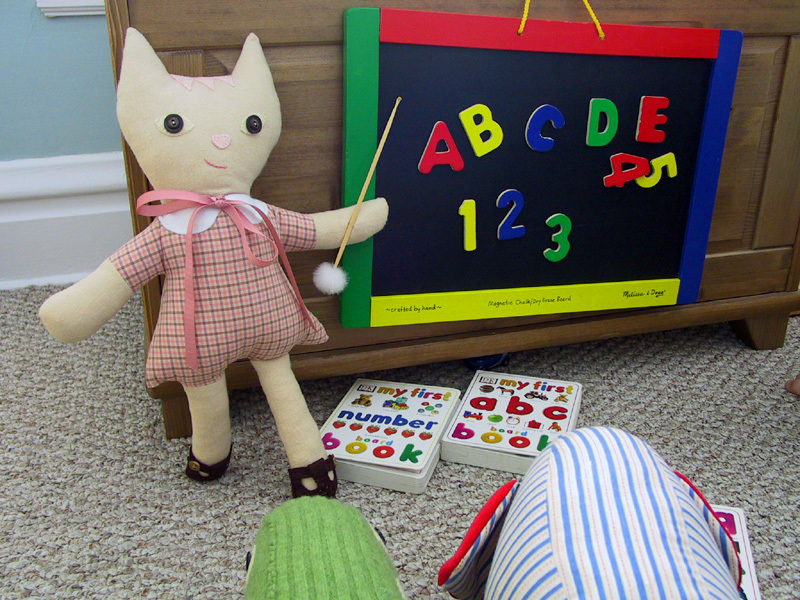 I totally agree that these stories and dolls would make great children’s books. Loved everything, then the cute little backpack sent sighs of cuteness going thru the room here at home! oh my god. hillary! you’re incredible. and please please tell me how you are getting your dollies to stand up. this is a kitty after my own heart. I loved the “practice waiting for the bus.” You can’t be any more excited about going to school than that! Love Paige. So cute! I couldn’t wait for you to get to the backpack. As soon as I saw the little straps over her shoulders I was like, “where is the picture of the backpack?” I adore that fabric. This is my favorite thus far. 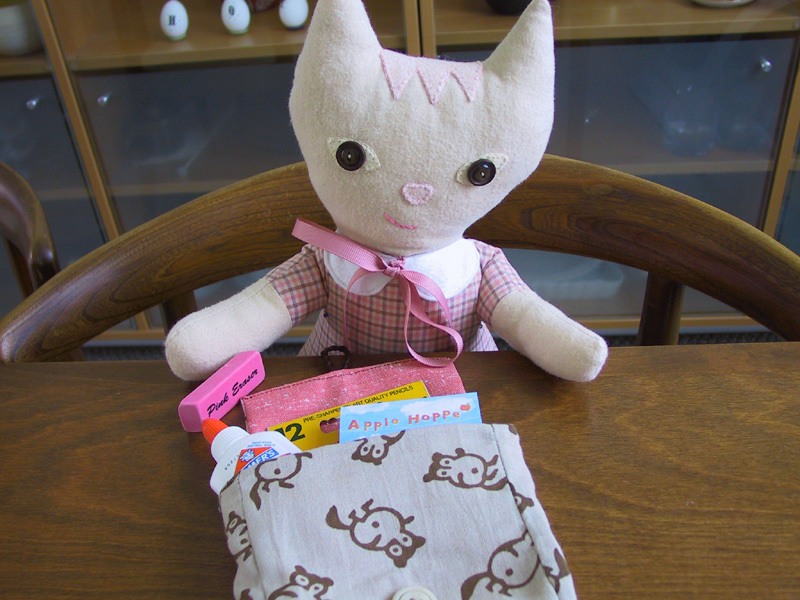 She is so sweet – my favorite part is the backpack. Really wonderful! So Cute! And her face has such personality. Love the kitties! SO CUTE!!! I love kitties! uh uh uh! The cuteness just doesn’t stop. She’s amazing. And so are you! oH my,she and her little story are too cute for words!Just adorable!And I agree,how oh how do you get them to stand up?! Oh my goodness – she is precious! Any chance she or her friends will be participating in a Wee Auction? ADORABLE! Paige reminds me a lot of me when I was small, very ready for school. You are so talented and clever! Does Paige have a home? Oh dear, I think I might have squealed when I first saw Paige. She’s a DOLL! (teribble pun, totally intended). I adore her backpack. I am so in love with her backpack. Your dolls have so much detail, they truly showcase your talent. so so cute, I love the backpack and the shoes. You make the most adorable kitties. So detailed…I look forward to your posts! So incredibly amazing, both Paige and her story. You should seriously consider doing your own series of childrens books, your pictures are great! Again with the cuteness! I love all the details–you do them so well. with every entry i wonder again how you do it all? amazing creations and creative stories to go with them! i would’ve had a much tougher time deciding between the mary jane’s and the loafers — they’re both so perfect! She’s adorable! 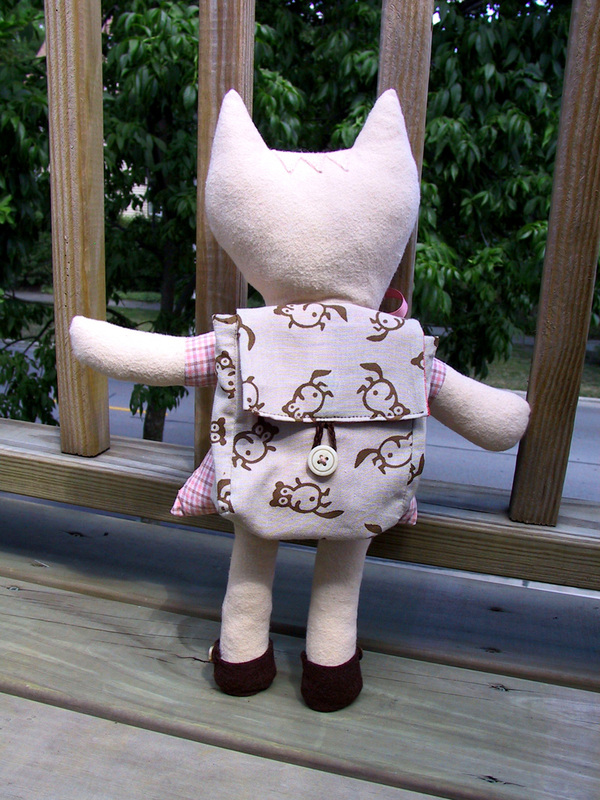 And the backpack is so cute. 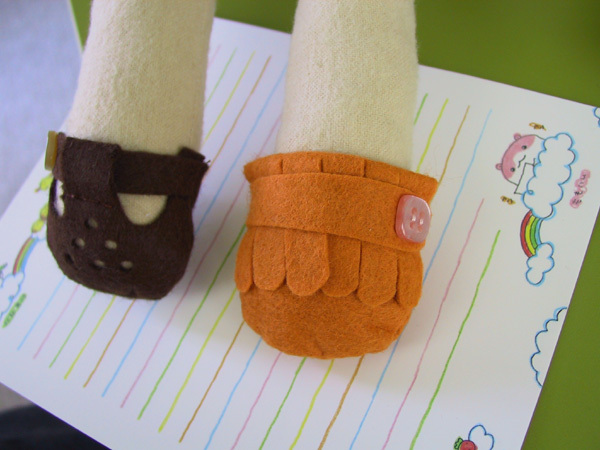 Why don’t you make a kids book with your dolls? It would be pretty amazing! thank you for taking the time to write such a thorough follow-up! The picture of her and Oscar at the playground cracks me up! He’s like totally ignoring her! (Or maybe he is just respecting her quiet time!) She is absolutely too cute, Hillary. i love her! Too much cuteness all in one package! Your attention to detail is astounding! Wow, you need to publish this as a kid’s book! So great! Your back stories are always so funny. I love them. What a cutie Paige is!! I love her back pack too! I love the picture where she´s reading a book and her school bag is so cute. that is the cutest doll. you make the best creations. plus her story is so cute. and if you do photoshop them, you do a really good job. i swear i thought she was walking around. haha.